Jack Russell Terrier, also known as Parson Jack Russell Terrier, emerged in England during the 19th century. The name of this breed is on Reverend John Russell who was a hunting enthusiast and the first person to breed these dogs for hunting of foxes. It is an expert of digging and burrowing in foxholes and dens. This breed is tough, strong, and energetic, is outgoing and has a keen expression. This breed of dogs has high vocals but never yaps and is brave despite their small height. Jack Russell Terrier is an affectionate and loyal dog. They are entertaining, active and robust and do well with older children. They are not recommended as pets for children below the age of eight and also do not get along with other pets. They love hunting and this have a fierce nature. They are very brainy and courageous because of which they may often get into dangerous situations which may prove to be fatal. They even seek a lot of human attention. The Jack Russell Terriers are easy to maintain. They need to be brushed and their nails need to be trimmed on a regular basis. However, they need to be bathed only when required. They have a thick double-coat which may be smooth, rough, and broken and they shed continuously. This breed may prove to be hard, firm, and stubborn and thus need strict and continuous counseling as they can easily be sidetracked. Early socialization and Obedience training is a must. 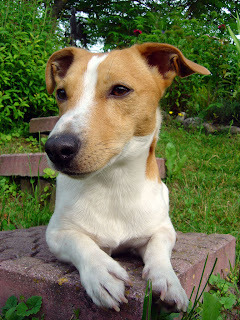 Jack Russell Terrier is extraordinary hunters and trackers. They live exercising and are very lively both indoors and out. They are most suited for a house with average size yard that is secure and fenced but may also survive in apartments provided they are given daily exercise. If they are bored then they can cause extensive damage.